You will love having these Game of Thrones coasters sitting on your coffee, or dining room table. Your friends will wish they had these unique hand crafted coasters too once they see them when they come over to visit. The best part is now you can drink beer, and not worry about leaving water rings on your tables that are almost impossible to remove. 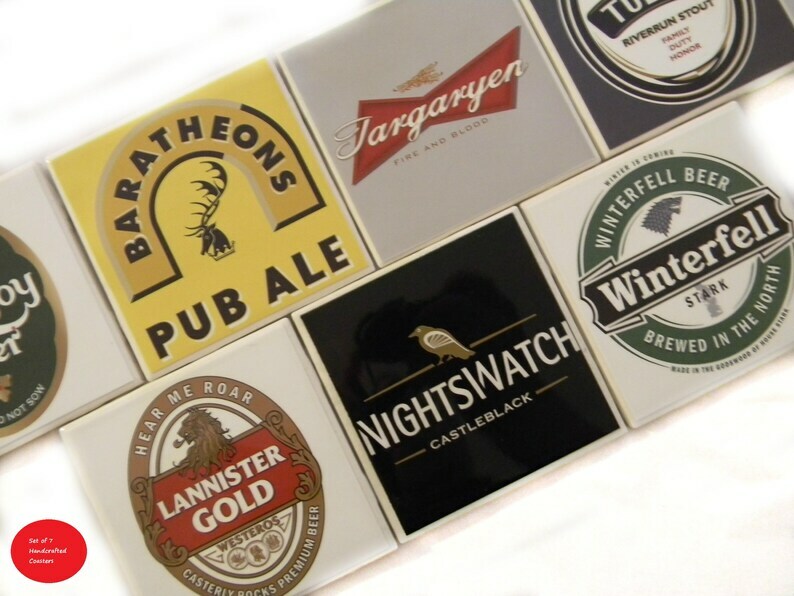 These Game of Thrones coasters are made with durable ceramic tiles. I use only premium photo paper, and OEM ink to bring out the best color, and quality of the beer labels. I apply a very adhesive glue to the tile, and apply the beer logo. After the glue dries I apply three separate coats of hand brushed polyurethane so that they will last a long time, and look very professional so you can always use them no matter who is coming over to visit. I also apply four felt button protectors on the bottom of each coaster to prevent and type of scratches to your furniture. I have hundreds of raving 5 star reviews of other customers who absolutely love my Game of Thrones coasters. You can view them here to see for yourself why my coasters are way better than any others you may find online. You be the judge that these Game of Thrones coasters will not only save your tables from nasty water rings, but they will outperform, and last much longer compared to other wooden, cork, or paperboard coasters which are almost a one time use that you may find online, or at a brick and mortar store. My coasters are easily cleaned with a damp soapy cloth, and stay looking like new for a very long time. - Game of Thrones Coasters Variety Set of Seven. - Lannister, Baratheon, Targaryen, Winterfell, Tully, Greyjoy, and Nightswatch included in this set. - Impress your friends with these matching Game of Thrones Adhesive beer labels to go along with their Game of Thrones coasters. I offer a 100% satisfaction guarantee on your Game of Thrones coasters, or your money back within 7 business days of delivery.